With wide expertise in the domain, we have come up with a remarkable gamut of Pearl Facial Kit. Consisting of toner, cleanser, scrub, massage cream, massage gel and face pack, this range is made using quality tested ingredients procured from the authorized vendors base. Available in various packing, this range is examined thoroughly by our quality controller team before being dispatched in the market. 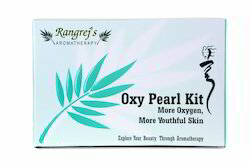 Being the foremost names of the industry, we are involved in providing an extensive range ofOxy Pearl Facial Kit.